Fendt CargoProfi. The new generation of front loaders. Fendt Cargo and CargoProfi front loaders are available for the 300, 500 and 700 Vario series. The additional sensor system installed in the swing arm enables completely new functions, including a weighing and tilt function. 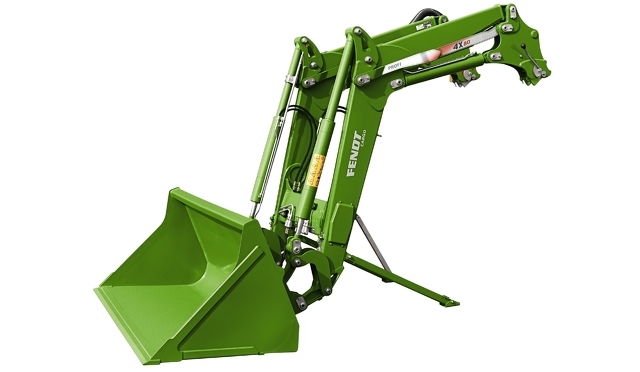 With this, the Fendt CargoProfi provides the perfect settings for safe and controlled loading. Fendt Cargo. Unbeatable in combination. The Fendt Cargo front loader offers advanced technology for maximum productivity. As a universal implement, it is the ideal partner for Vario tractors. All models are equipped with the unique Cargo Lock coupling system and parallel guidance with Z-kinematics. The attachment is conveniently unlocked using a lever on the quick-attach frame; it just takes a flick of the hand. When mounting an attachment, lock it automatically by tipping it back completely. The driver can use the pushbutton in the cab to hydraulically lock and unlock the attachment. This makes frequent tool changes quick and easy without having to get out of the cab. The two lock indicators show the driver that the attachment is locked on both sides (does not apply to the 3X swing arm). The light material bucket is available in the widths 1850 mm (0.976 m3 flush volume) and 2400 mm (1.265 m3 flush volume). The universal bucket is available in four sizes: 1600 mm wide (0.538 m3 flush volume), 1850 mm wide (0.622 m3 flush volume), 2100 mm wide (0.706 m3 flush volume) and 2400 mm wide (0.807 m3). The heavy-duty bucket is available in the widths 1600 mm (0.512 m3 flush volume) and 2100 mm (0.672 m3 flush volume). The bale grab is designed for bales with an outer diameter ranging from 900 mm to 1900 mm. The big bale fork has three tines and is 1500 mm wide. The palette fork is designed for loads up to 2000 kg, tine length 1100 mm. The silage grabber comes in two sizes: 1800 mm wide (1.00 m3 flush volume) and 2200 mm (1.25 m3 flush volume).